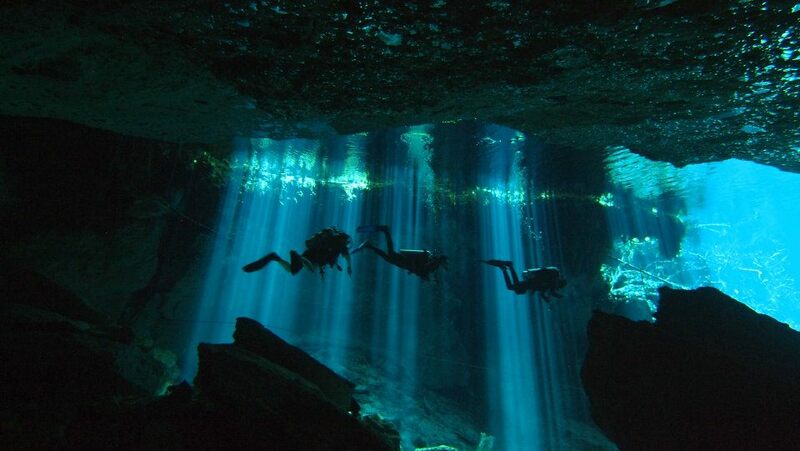 Crystal- clear water, no current, shallow depths, relaxed diving without time pressure, spectacular dripstone formations and light shows, water temperature constantly at at least 24°C/ 75F (throughout the year). To sign in for a cavern dive, you have to have a Open Water certification, recent dive experience and good buoyancy control. Awareness: your level or awareness must have reached already the point where your focus is not on the basic diving skills. Be proficient with fin kicks, trim and your position in the water column, practise good equalisation techniques. We always start easy and I explain all, so no worries that you are not able to enjoy some cavern dives. As a good guide, I will take care of you and guide you from the beginning through the proper procedures. Buoyancy skills appropriate to dive site; there are places that are good to start your experience in cavern diving and I will choose the ones appropriate to your dive level and skills. There are more open caverns close to the daylight and later we go to the darker ones, more decorated, more sediment etc. Conservation; no littering of the outside which I hope I do not need to point out the importance (but to remind you, whatever packaging we bring to the dive site, we will take it back home and not dispose in any of the garbage buckets); Also no vandalism in the cave; purposeful touching of formations or collecting things are unacceptable for me. Graffiti will result in an immediate ban of diving.